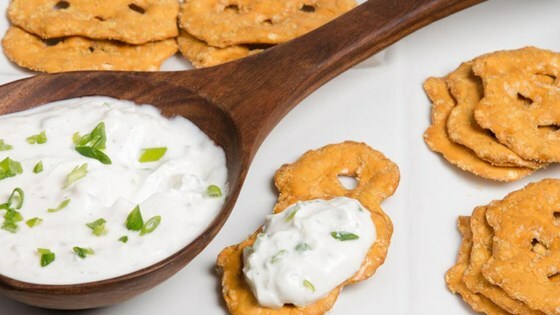 "Here's a delicious variation on a classic onion soup dip to serve with Snack Factory® Pretzel Crisps®." Combine sour cream and soup mix in a bowl, stir thoroughly and then refrigerate for 20 minutes. Remove from the refrigerator, top with chopped chives and serve with your favorite flavor of Pretzel Crisps(R). Caramelized onions are infused in a rich broth, topped with bread and cheese.